A BGA pitch of 0.8 mm represents the borderline case, where the layout of mechanically drilled PTHs is still possible. The use of Microvia Technology pays off economically some way before this, as the production of microvias holes is significantly cheaper than mechanically-drilled holes. The outer layer is not available for the layout of inner BGA rows. Also here the outer layer is not available to layout the BGA. The outer layer can be used fully to layout the BGA! Each technology offers advantages in layout. However, laser-drilled microvias is an additional process that generates costs. Direct comparison of the variable production costs (tool costs, processing costs, energy, etc.) between microvias (Ø 125 µm hole / 300 µm pad) and mechanically-drilled vias (Ø 300 µm hole / 550 µm pad) shows that the substitution of approx. 180 mechanically-drilled vias per dm² with microvias represents the breakeven point (cf. Fig. below). From this point onwards, the drilling costs become cheaper with an increasing number of mechanical holes substituted. 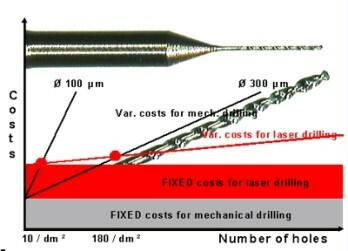 The main reason for this is the high tool costs and the relatively low drilling frequency for mechanical drilling, whereas no tool costs arise for laser drilling and the drilling frequency is around 200 holes per second. Conclusion: If Microvia Technology is deployed, then as many microvias as possible should be used as compared with mechanically-drilled vias to save drilling costs.